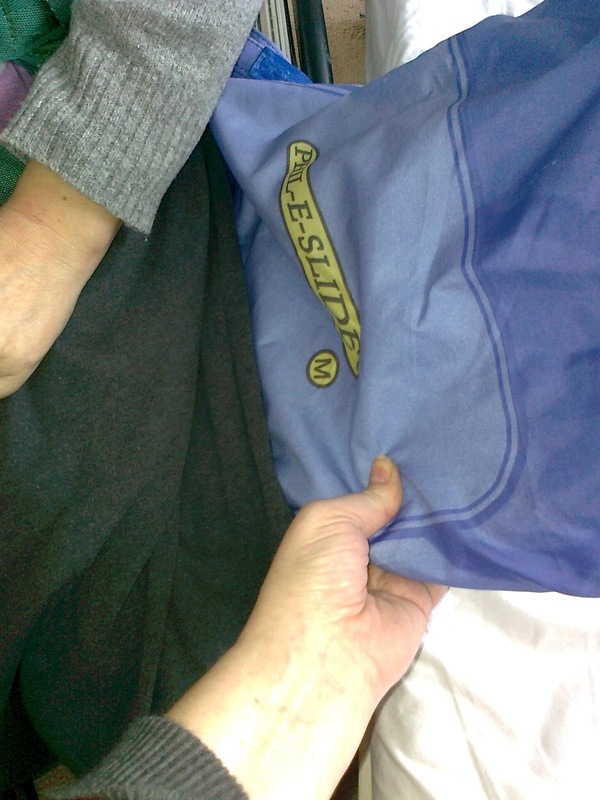 Now, that is it… I take the plunge and will breach the delicate subject of continence and home care products. When Multiple Sclerosis (MS) progresses, there is a sad common aspect that remains very private…it is continence. Do talk about this to your neurologist. It works very well: in the Bristol Brain Centre I have a whole multidisciplinary team looking after me. There is no holiday; I got a letter from the Urology team today! Meanwhile, there is the domiciliary care that needs to be managed! It might involve buying gloves for the assistance that you receive and continence pads…so you can keep yourself looking and feeling your best, whatever your condition. I had found a company that provided me with products very reliably. I am able to order online or buy from them on the telephone. This beats buying packs of bags one at a time or feeling lucky to find any at the supermarket. I found a video that shows their self-service is easy. My next question was about being VAT exempt...They have sent me a form...They need a form signed with the order reference each time you place an order. When your orders are over £50, the delivery is free. It is also discreet and dignified to have them delivered. It is helping to find a way of getting supplies without nursing staff telling you that you do not qualify for any help according to their criteria. I will get a VAT refund. 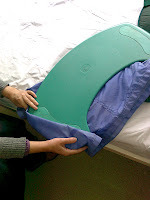 I have been using a curved transfer board (aka banana board) provided to me in the hospital when I was getting ready for returning home. My stay in hospital had lasted 15 weeks. 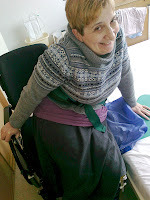 I have had Multiple Sclerosis (MS) for more than 40 years and it has slowly but surely settled into Secondary Progressive MS.
Before my 2008 stay in the hospital, I was able to transfer from seat to seat with efforts by myself. I was able to walk a few steps with assistance, a few times a day using crutches. At the time of my hospital discharge, on 3rd June 2008, I was not able to stand within the time it had been expected to make a recovery in hospital. 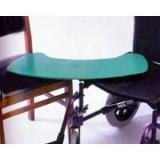 In order to be able to return home, my only option was to accept the idea and pretty fast to use a curved sliding board for transfers because of the wheel of my self-propelling wheelchair. I was lucky to be trained to use the curved sliding board with assistance using a looped sliding sheet slightly pinched under the board by just one inch or two centimetres under the board. I need to position the wheelchair at an angle less than 90 degrees between the chair and the bed so the transfer is short. The bed is close. The curve of the board fits around the wheel. It is flat AND I feel safe! board under with help of the client. If I am transferring from wheelchair to another, I think it works better with the two seats placed at an angle of 90 degrees so both sets of wheels are in the inner curve AND the board is flat! Placing hand on board where one is going helps.. Placing my hand on the board where I wish my bottom to be at the end of the transfer. I bend slightly forward and with my feet on the ground, I step sideways to the desired position. When the end of the pinched sliding sheet is visible I usually ask my assistant to release it. The joke is to say “give me some gas”. Gaining a bit of speed provided by the looped sliding sheet I arrive safely without overtiring. My clothes and the floor are not covered in talcum powder that is used often instead of the looped sliding sheet. This is useful when a care assistant is timed by Social Services and Care Agencies to stay half an hour! I find it astonishing that care assistants are not trained using this method of transfer. It is difficult to a person receiving the service to show the safest way for the assistant to place the board between the thigh and the body contoured pressure seat cushion. I have been given amazing explanations…Some are adamant that the board should be used by me on my own! Some ignore the curve…some would place the curved board upside down…showing the pads that are supposed to be underneath for the board to remain secure under the person using it! It certainly adds to the MS fatigue when you are biting your tongue! I wish I could meet the persons giving handling instructions, as some declare after returning from handling course that board are not used any more (gulp!)! I wonder where I would be without my curved transfer board! Multiple Sclerosis fatigue has its ways of weighing down my shoulders and will scupper all my efforts to improve my mobility. someone to help me with a sling in place was not in my care package and the mobile hoist scale not available easily...It was a bit better than once in a blue moon. It became important to know my weight before surgery in Southmead ( the pre-op check staff were not able to weigh me). 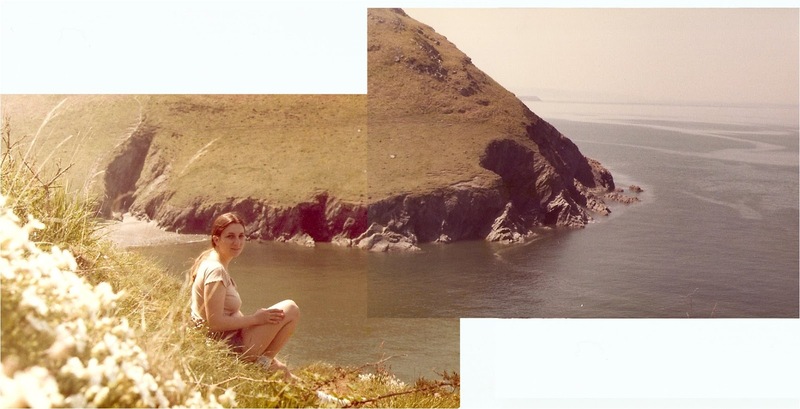 I decided to ignore my care package and did a trip to Paulton Memorial Hospital (PMH). 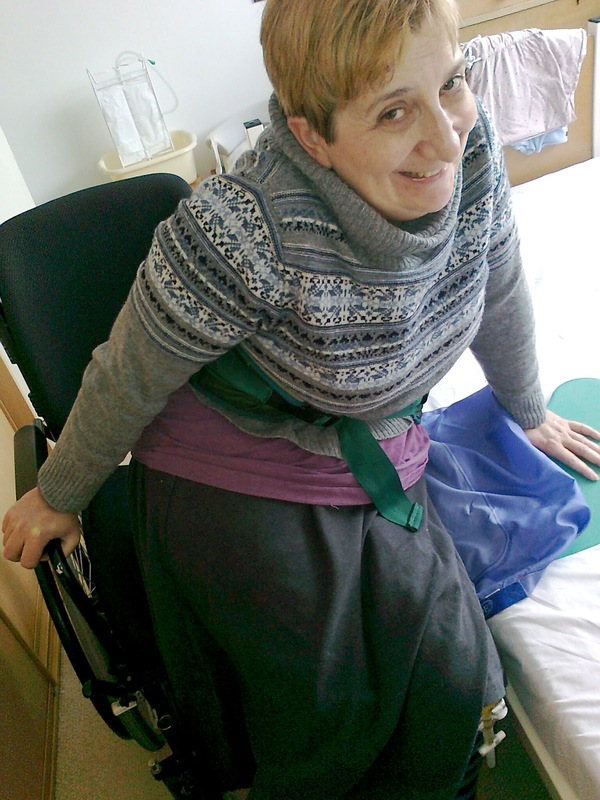 There is a weighing seat that is offered ( this is only available in the afternoon and using my own assistance which meant that more staff were needed to hoist me from the floor with the digital hoist...not the first choice as it is for the in-patients). It has been such a long quest that I wrote about this! I asked my GP. My knowing my weight was now urgent. Losing it also. My GP did not realise what I meant by not being able to know my weight. I had been referred to a dietician a few months before but that does not mean one is going to be weighed. I found that the dietician can come only every three months. Maybe six months or it can be less. 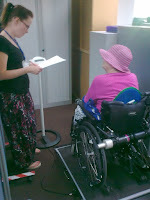 I found that the Vassall Centre has a weighing facility in the Driving and Mobility Service of Disability Living Centre. Some bending of the care package meant a trip to be weighed once a month was a possibility. 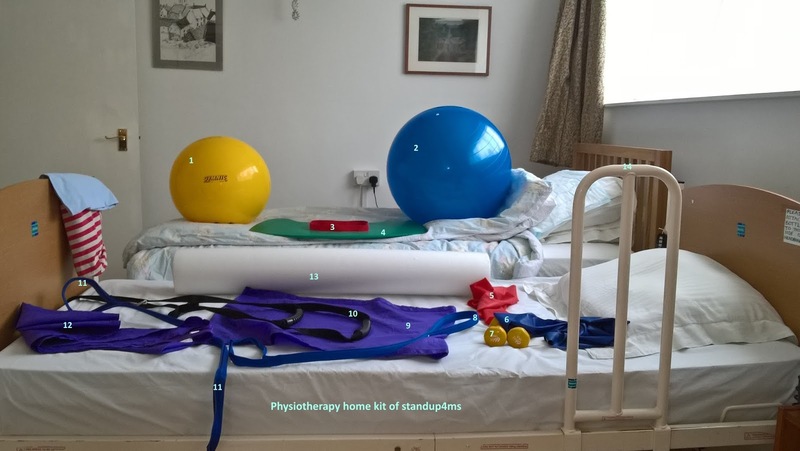 The service had been able to help with a hoist as their Occupational Therapist (OT) was able to check my wheelchair weight. It was called Living and Mobility but it lost its tender and has been renamed. The service carries on to help us. It does not take any new people on their lists. I think it might not last for long as the weighing platform needs calibration. 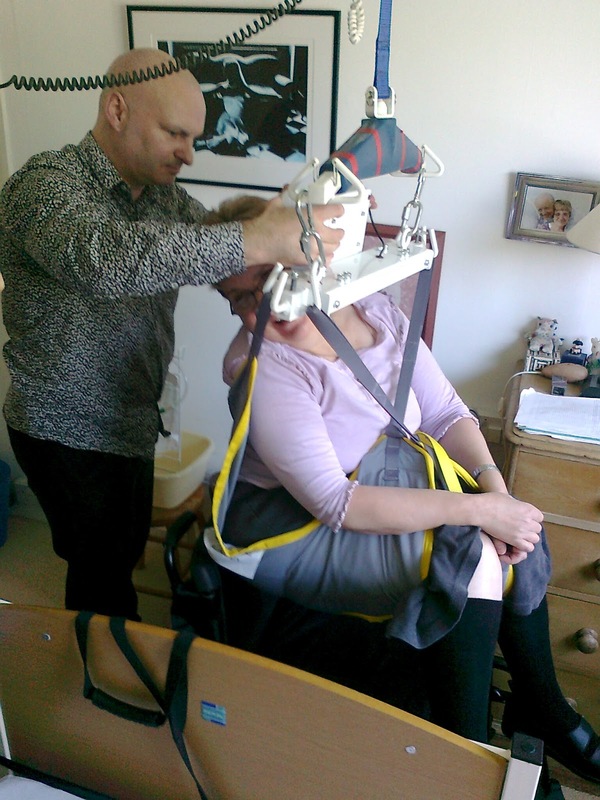 The local MS therapy centres in Bradley Stoke, South Gloucestershire and Warminster, West Wiltshire have a digital hoist for their members. So transport and membership fee are needed...I think that the trouble of getting as far as these two needs a lot of care and planning regarding my catheter. 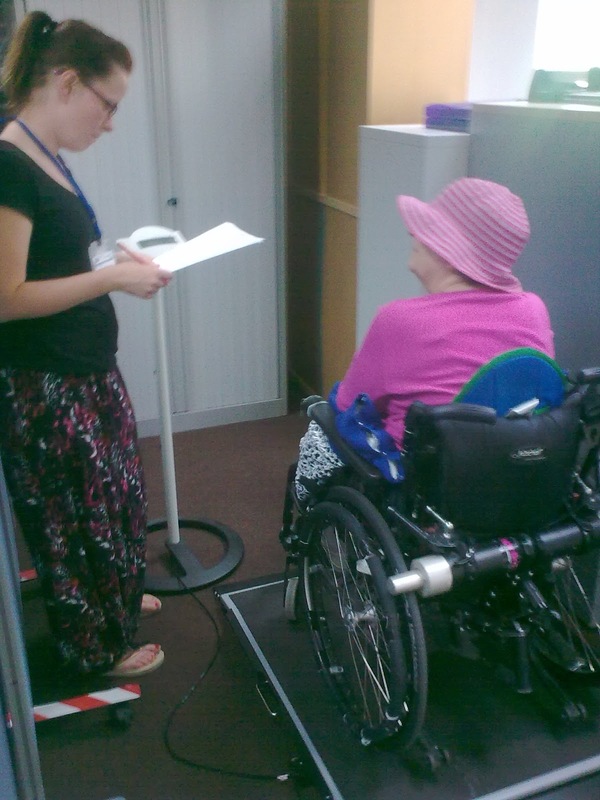 The dialysis service in Bath (RUH) has a weighing platform for their kidney patients. This is the kit I use most days for my "rest" period on my hospital bed in the afternoon. I do not use all the kit every time be reassured of this and it took me a long time to think I had reached the stage that needed a new aid. I rest on the bed. It is resting my back which has been "standing" from 8:30 in the morning. It is tiring to be sat in a wheelchair, especially with someone talking to me. I need to look up and try to get the conversation going. I have to move and reach for objects around me. It is like running on the spot! By 14::00 I welcome a stretch on my back, it feels so cool and calming. BedCaddie: ladder-like design with 3 hand-grips to make it easier to sit-up in bed. I have a good static air mattress. I cannot use a gym mat or gym floor. I can use a wheelchair but it is limiting the movements. I roll on my belly and raise my head backwards. There is something very important that I must write about today. I have written about podiatry before. It is very important to get a regular podiatry appointment: if your mobility is reduced in the lower limbs you may get into difficulties at some stage when you fancy cutting your toe nails. I found myself trapped by the system. I did not know a friendly supporting person that would have simplified this for me. I hear that in some part of the country they talk about a "care navigator". I bought a pack of emery files. I had a first toe nail infection before I got referred to the podiatrist. As you will understand it I got a bit obsessed in trying to avoid the infection that remained a threat. There where moments of poor staffing in my area for the toe clipping service with barely any explanation. I had difficulties getting the staff sent to me by the commissioned care company sent by the social services of Bath and North East Somerset to help me file my toe nails at home when I felt pain. abuse from a care worker. I got myself in the not very frequent toe nail clipping clinic available in my community. I got in the rhythm: phone after two weeks then filing and clipping two weeks before an appointment...That will take care of odd sharpness. When one day I remarked to the podiatrist that my MS was definitely affecting my toes. I was always twitching and having toes flexing upwards. At the same time I was still using an NHS wheelchair with no foot rests... I explained each time that it was easier for me to approach the loo to empty my catheter leg bag. My commode was always on the loo, just in case. 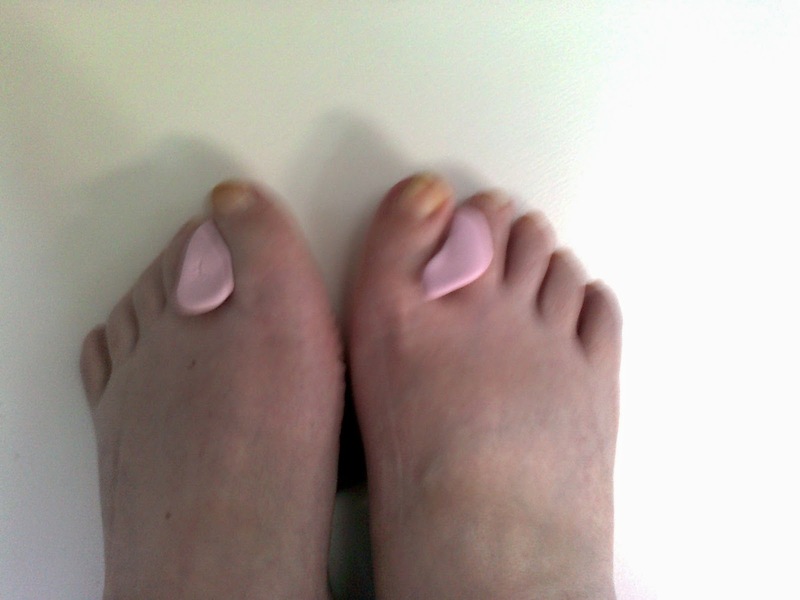 The very good idea was to buy following a podiatrist's appointment a pair of gel looped toe spreaders. It reduced some of the spasms. I have not needed botulinum toxin injections perfomed by a neurologist and a radiologistsince. Any spasms are due to forgetting the spreaders or placing them wrongly. These bought spreaders were too wide and my second toe turned black although I did not feel pain. This went on for a couple of years. LR looking at bespoke toe spreaders. spreaders that would fit me. They are part of my routine. They get rinsed at night and drip dry until the next day. They are individual, lightweight and very important to my well being. They are not interchangeable. They have helped feel less spasms in my right leg. I feel that my leg is less contracted. I am able to use foot rest indoors on my wheelchair now. The Wheelchair Service finally got it that I needed to remove these. I can lift them now, they are light. They have also a heal strap. I got this after pestering and contacting the company that sold it to the NHS. I know I will be able to remove and replace my feet on my foot rest easily. It has become very "normal". I even followed some advice regarding the angle of my knee to have a good posture. I have less fatigue and no cramps on the right leg. So, I think that podiatry care should be automatically included in any care plan for a person with many symptoms of Multiple Sclerosis. Why did it take me so long to get to this result? How many people have the same problem? Why did I have six toe nail infections in two years?